My father has figured out how to forward emails. I find his new skill to be endearing because my INBOX is now filled with fluffy, sentimental, feel-good stories of firemen assisting a kid dying of leukemia; funny stories about the state, beavers, and dam permits; laugh-out-loud stories about atheist's in the woods and Christian bears; yes, there's a pile of email in my INBOX from my dad. If it were from anyone else, I'd probably delete the email before reviewing it because I'm sure I've read the stories before. I can't count how many times people have sent me the same story. Yet, because they come from my father, I treat them as if they are all Hallmark cards and I tear up incessantly as I read them. My father and I have always been really close. 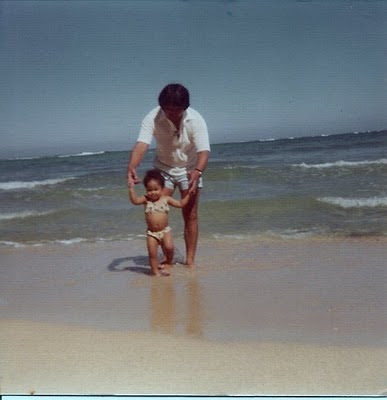 Even when I was doing things that were contrary to my upbringing, he was always very patient as I went through the hard stuff. His quiet wisdom still inspires me even though we are so far apart. There's just something about little girl's and their father's. There is no relationship on earth that can replace or mimic it. Sometimes I wish I never grew up. I wish that I could spend all my day's serving my parents but at some point, we all have to face the world on our own. I will continue to open those sentimental emails. I will continue to imagine my father, sitting at the desk, reading them before he sends them to me. And I will imagine that I am right there in Hau'ula, where I wish I could spend all the days of my life. Now trade him some back! He'd love that. Sweet! I love how even when you're a grown lady, he still calls you Baby! Just the other day, I saw him training Keith for football. I thought, "what a sweet dad!"